San Fransisco, home to many crypto projects, featured in the 1985 Roger Moore classic ‘A View to a Kill’. That’s where the similarities end. What do crypto-assets actually do? Oftentimes people say that bitcoin isn’t money because it’s volatile, and Ethereum is just a platform for digital cats. We believe this is underplaying one of the biggest breakthroughs of our time. Bitcoinwas the first digitally scarce,censorship resistant (i.e. unseizable) asset that you could ownon the internet. To make this happen, Bitcoin brought in a new form of decentralised coordination or organisational structure. It established a new way to organise people in a way that was not centrally coordinated but rather coordinated by incentives baked into the design of its protocol, namely a scarce game theoretic token called bitcoin. Crypto is digital ownership as well as a new way to organise humans without the need of central coordination. We can break down the digital assets part of crypto into three categories: Money, Personal Data, and Digital Goods. So far, the killer app of crypto is currently the ability to create government independent money. Until recently, circulating new and government independent currencies was very difficult. This is because the money needed to be centralised, and that centralised actor widely trusted. Trust comes into the equation because most monetary systems are centralised for mediation purposes. There usually needs to be a trusted party to ensure that economic value transfer between two parties is legitimate. Bitcoin enabled truely peer-to-peer economic transfer over the internet for the first time. Now there are over 1600 crypto assets. In decentralised, trustless, and permissionless crypto networks (the type Apollo Capital are interested in), the token is the money to that economy. It is that critical. The proliferation of distributed ledger technology, notably blockchain, has made creating, distributing, and using new money trivially simple (on the condition that others also use that same money). “Digital Slavery” is the state that artist Jennifer Lyn Moronethinks most Americans currently live in. In order to get access to free online services, she laments, people hand over intimate information to technology firms. “Personal data is much more valuable than you think,” she says. In March, it was revealed that Cambridge Analytica, a now defunct political consultancy, acquired data on 87 million Facebook users in underhand ways. The collection and exploitation of personal data is the major business model of the current internet, often called Web 2.0. This practice is dominated by large tech firms, namely Google, Facebook, and Amazon. Crypto and blockchain technology allows ownership in the digital arena. This extends to the currently under compensated and increasingly important economic resource of personal data. People are thinking about this: Angela Merkel, Germany’s Chancellor, recently called for a price on personal data. Web 3 is the next generation of the web in which decentralized apps (dApps) operate on top of a shared data layer and users have control of their data and the ability to move between dApps with little to no switching costs. Seen last week on Gertrude Street, Melbourne. 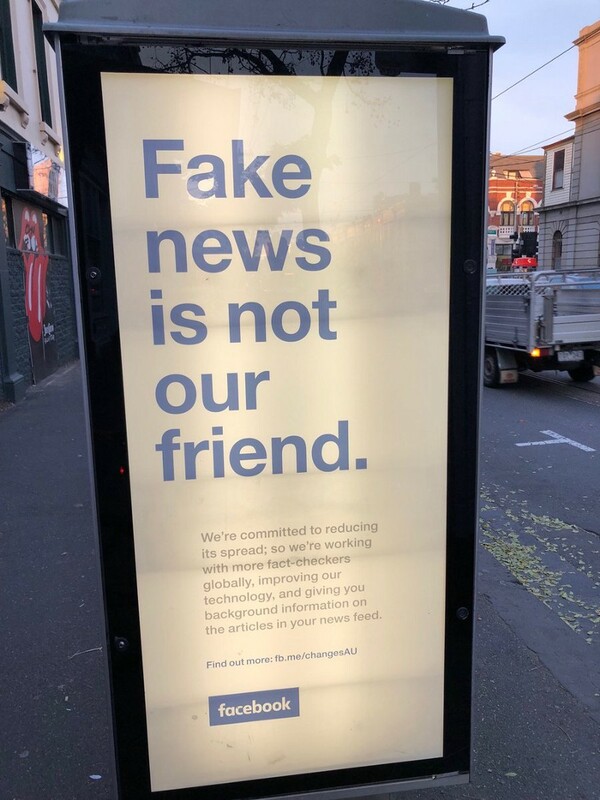 Facebook is trying to counter the brand damage following the Cambridge Analytica fiasco, reports of fake news, and people waking up to economic and social costs of social media. Other areas where personal data could be personally owned using crypto-assets is in the fields of medical data — a project called Shivom is making a genomic data-hub where contributors own their genomic data, control the right to access it, and receive rewards if they choose to share it. People may also be able to own and control the data they contribute to more traditional online activities such as on decentralised version LinkedIn or Twitter. Digital Goods are unique digital objects that are enabled by blockchain technology. We are seeing glimpses of this world in games, where on Crypto Kitties and CryptoStrikersyou are able to buy digitally scarce cats and playing cards respectively. It the Web 3 decentralised application world, this could mean moving your pet cat, say, from one computer game to another, seamlessly. 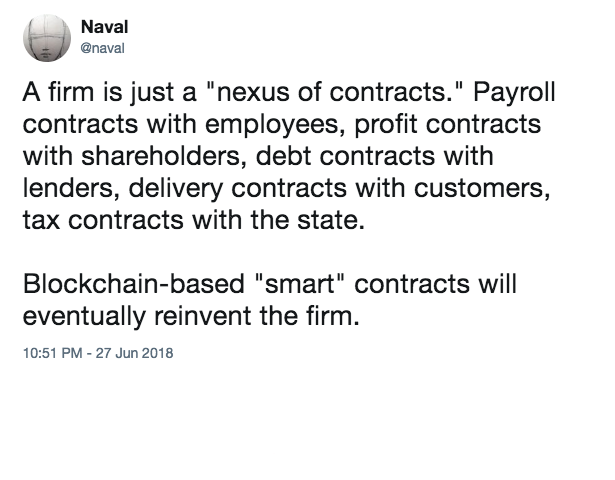 A smart contractis intended to digitally facilitate, verify, and/or enforce the negotiation or performance of a contract. Smart contracts allow the performance of transactions without third parties. These transactions are trackable and irreversible. The inventor of smart contracts Nick Szabo once wrote that, “In a few years teenagers in Indiana will be swapping over-the-blockchain derivatives with grandmas in India without asking New York City”. Apollo Capital has long thought of financial contracts as being low-hanging fruit for smart contract technology. Derivatives, like smart contracts, are agreements that are built on systems with clear rules and quantifiable terms of agreement. dYdXis an exciting project that is about to make crypto-derivates a reality. We spoke with Zhouxun Yin from dYdx a few months ago. This project is a glimpse at the $1.2 quadrillion global derivative market entering this industry. It is also great for those who own crypto-assets as derivatives can be a way to manage risk in a portfolio, improve market efficiency, and improve price discovery. This is a classic example of the disintermediation of financial projects that this technology enables. Instead of going through a bank to collateralise, the MakerDao platform allows consumers to bypass banking institutions in a way that could spell significant consequences of the structure of the global economy. The platform currently is fairly primitive, relatively difficult to use, and you can only collateralise ETH (well, technically wrapped ETH). However, these are not insurmountable challenges. The fact remains that smart contracts enable people to draw out money from exisiting assets at an interest rate of only 0.05%. That’s a big deal. ICOs, also known as token sales, involve the sale of newly minted crypto coins based on Ethereum or another smart contract platform. 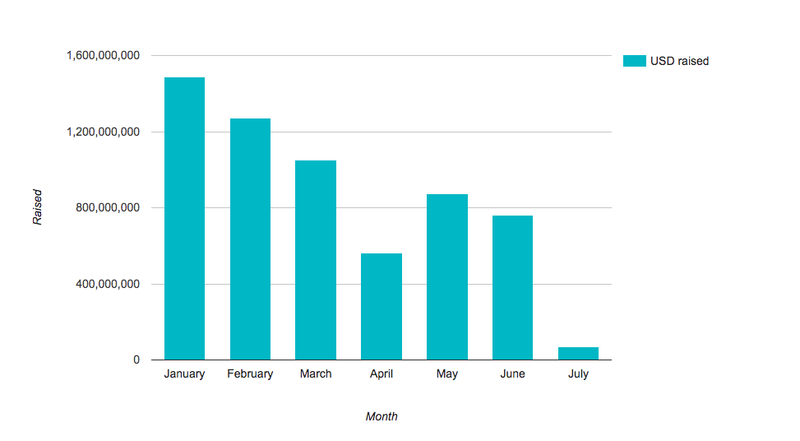 The ICO hype of recent months has led to an immense amount of capital raised. In 2018, ICOs have so far raised a staggering $6,028,714,036, according to ICOdata. The most significant ICO of this quarter of EOS, which concluded on June 1, and ultimately raised over US$4 billion, or 7.12 million ETH. This ICO was conducted over a year, from June 26 2017 to June 1 2018. Basis, the ‘algorithmic central bank’ raised $133 million from Bain Capital, Lightspeed Venture Partners, and others. Aside from these, there were approximately 600 other ICOs that took place in Q2 2018. A DAO is a vision of a community that can function without traditional hierarchical management or centralisation. It is a form of organisation structure where its rules, agreements, and other principles could be hard-coded from the beginning and software could facilitate transactions and transfers of property between participants. The rules in a DAO are enforced digitally (usually via a smart contract). By relying on smart contracts, DAOs establish a set of rules at inception which govern agreements and relationships between participants in a network. For example, digital agreements can be set to see funds paid out at certain dates, refunds occur if certain conditions are not met, and so on. In some ways Bitcoin is a primitive example of a DAO. There is no “Bitcoin Corp.” that pays miners to authenticate transactions on behalf of the community; there is no central organisation that promotes or builds the bitcoin ecosystem. Satoshi Nakamoto created bitcoin, set it up sufficiently, then promptly and purposefully disappeared. Because if its hard-wired incentives, humans came and contributed without the need of central coordination. Through its code, bitcoin is thus decentralised, autonomous, and a form of human organisation. It is a DAO. Much more complex DAOs will be built at a later date. These will have their own values, governance structures, and incentive regimes. 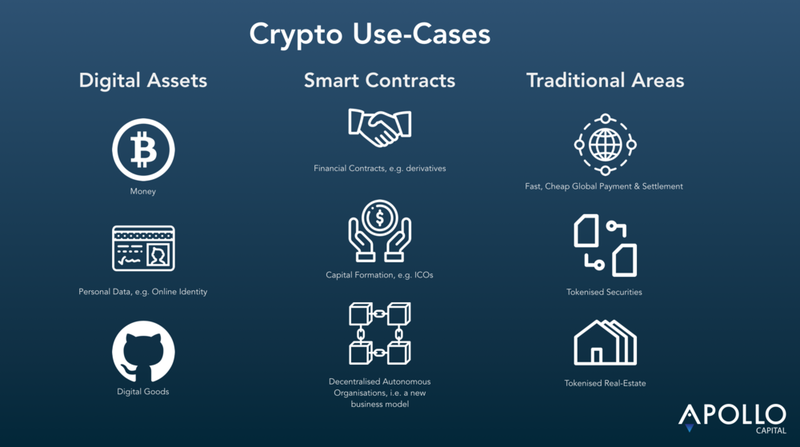 We sometimes think of crypto-assets as a distinct asset class, separate from traditional equity, debt, and derivate markets, but what if blockchain-based tokenisation could be used in traditional markets to improve the way society records ownership and trade assets, and thus re-engineer large swathes of today’s financial plumbing. This is the grand hope of security tokenisation, which hopes to increase the settlement speed, liquidity, and increase fractional ownership. What security tokenisation doesis imbed the security with its compliance requirements into smart contracts so that its tokens can be traded on secondary blockchain-based exchanges anywhere in the world. A security token may thus be less an invention than an innovation — it could improve traditional financial products, removing middle men from transactions, reducing cost, and linking more buyers with sellers. The massive challenge to overcome in this field is the robust tethering of real-world assets to blockchains. Real world assets, like stocks and real estate, are regulated by the jurisdiction it happens to be in. This means the security is connected with something in addition to the smart contract created. Because of this, possession in a smart contract doesn’t necessarily mean possession in the real world. With real world asset tokenisation, possession in a smart contract doesn’t necessarily mean possession in the real world. This is the greatest hurdle to overcome. It’ll be interesting to see whether the world of crypto will be able to connect real world ownership to decentralised and global trading through smart contracts; I’m very uncertain about it, although we hope that further work will go into bolstering security, oracles, and the legal enforceability of smart contracts across jurisdictions. The [Web 3] time will come. I am more sure about that than anything else right now. The last few years of Web 2 have shown us what is wrong with the current architecture of the web and what we need to do to fix it. The use-cases for crypto will no doubt evolve. This is Apollo Capital’s punt at where we see things going. Newer PostShould you add crypto to your investment portfolio?